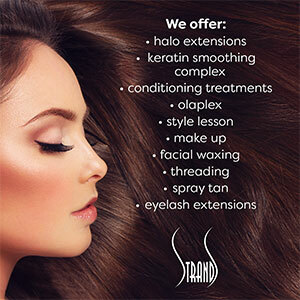 STRANDS is a boutique salon with 20+ years experience. We are a friendly, relaxing salon located in the historic DeMun neighborhood of Clayton. Strands is home to certified stylists who are exceptionally talented in the art of hair. At Strands, we always want you to look your best. Our stylists draw inspiration from the world of fashion and art to stay on top of current trends, and to create the styles and designs that will showcase your individual beauty. We love to provide our clients with personalized tips on styling techniques for their hair, and recommendations of our top of the line hair care products. We offer a wide variety of services that includes expert cuts and styling for women, men, and children, traditional and creative color services, and Keratin Complex straightening treatments. Appointments are Encouraged. We also specialize in bridal styles and makeup (In salon, and on location). Check out Alive Magazine's top three salons in St. Louis! Check out our feature in the special Clayton: A Century of Quality!